The schools are hosted by Virginia Cooperative extension and the Caroline County Agricultural Fair Association. 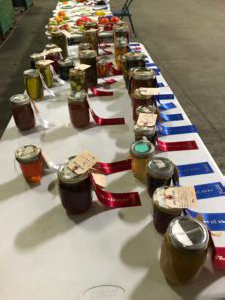 The purpose of the judging school is to train and certify judges for county fairs, the State Fair of Virginia, and other related competitions throughout the Commonwealth. All instructors are certified and have taught at fair judging schools throughout Virginia, Maryland and other neighboring states. The course objectives include the following: Preparing individuals for evaluating indoor exhibits and helping them gain a greater understanding of state and local fairs and the educational opportunity which they present. The course also hopes to increase the knowledge of state and local fair judges regarding different evaluation systems and procedures as well as creating awareness regarding a positive experience for the exhibitors at fairs and other events. And finally to develop a pool and maintain a roster of high quality certified judges. Participants should have some knowledge of the subject area (s) they plan to register for and are encouraged to bring samples to be discussed in the class. You can also pick up forms at the Grayson County extension office or at the Grasyon Landcare/IFM office Wednesdays from 10 am to 6 pm. If you want to carpool, email Michelle at independencefarmersmarket@gmail.com. This entry was posted in County Fair and tagged county fair, judging. Bookmark the permalink. ← Cooking with Chef Jen THIS Friday!